Did you know that your roof is one of your first lines of defense for keeping your home cool? It’s also one of the most important parts of your home to maintain. “Having a roof over your head” has always been one of those things that people are most grateful for – you don’t want something to happen to that roof because of lack of maintenance. Roofing doesn’t require a ton of maintenance, but there are certain things that you should do every year to help ensure that your roof is properly insulating your home and that there’s no chance that it’s going to collapse or fail. What Can You Do to Improve Roofing Maintenance this Summer? Inspect it – The first step in just about any maintenance situation is to do a thorough inspection. Start on the ground and check your gutters and eaves. You should also try to see if there are any shingles hanging off or anything growing on your roof. If you need a better view, properly and carefully set up a ladder to climb up and get a look at what’s going on. 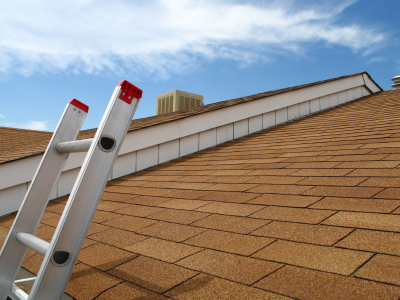 Clean – It’s very important to remember to clean out your gutters. You don’t want them to get stopped up or weighted down, especially with all of the rain that we get in Baltimore during the summer. If you notice any type of moss or fungus that you can personally clean off, get that off as well to avoid it eating through your roof. Ventilation Systems – Make sure that you’re checking your ventilation. The vents around your roof and outdoor walls can present problems if they’re not properly maintained or if they’re letting water in where they’re not supposed to. Your ventilation systems also help keep your home cool naturally. If they’re not working properly, you’re electricity bill may shoot up. What if There’s Something Wrong with Your Roof? Roofing maintenance and repair isn’t a good DIY project, especially if you don’t have any experience in roofing. Your roof is arguably the most important part of the exterior of your home. You need a professional to come out and do an inspection if you notice anything that seems off. At Atlantic Maintenance Group, we do roof repair to help you avoid the problems that a poorly maintained roof can bring up. To get your free quote for roofing maintenance, give us a call at 410-768-4720 or contact us via our website today. This entry was posted on Friday, July 18th, 2014	at 2:17 pm	and is filed under Roofing Maintenance	. You can follow any responses to this entry through the RSS 2.0	feed. Both comments and pings are currently closed.